Just about everyone loves eating ice cream—what’s better than a cool, sweet treat on a hot day? When you make your next trip to the local creamery, you might be wondering if it's OK to buy your dog a pupsicle. In other words, is it safe for your dog to eat ice cream? The main takeaway is that ice cream isn’t a healthy snack option for dogs. While the occasional small amount of vanilla ice cream or mango sorbet probably won’t send your dog to the vet, ice cream shouldn’t be a regular treat for your dog. Adult dogs don’t have stomachs that are really ready to handle lactose. While they can digest milk as puppies (they’re mammals, after all), they really can’t digest milk as adults. This inability to deal with dairy can lead to bloating, gas, diarrhea, and vomiting. In most cases, your dog will probably just be a bit gassy. But if you give a small dog a lot of ice cream, your dog’s reaction to the dairy can be more serious. Also, dogs with diabetes or weight issues should stay far away from ice cream. The high levels of sugar in ice cream are also no good for your dog. Even “sugarless” ice cream is dangerous because xylitol is toxic to dogs. In fact, ice cream with any sort of artificial sweetener is probably a no-go for your pup. Many flavors of ice cream are also potentially dangerous for dogs. Chocolate is dangerous because dogs cannot digest theobromine. Coffee and green tea ice cream are both dangerous due to caffeine levels. And any ice cream with grapes or raisins is potentially dangerous and can cause acute kidney failure at even small doses. Finally, some nuts are dangerous for dogs. Macadamia nuts are dangerous for your dog - though scientists don’t know why. Pecans, walnuts, and almonds aren’t toxic for dogs but are too high in fat to be healthy. If you do decide to give your dog ice cream, stick with fruit-flavored ice cream or plain vanilla. Be sure to feed small amounts at first to make sure that it doesn’t upset your dog’s stomach. You’ll probably see symptoms, like bloating, gas, vomiting, gastrointestinal upset and diarrhea, within two hours if your dog’s stomach isn’t going to agree with the dairy. 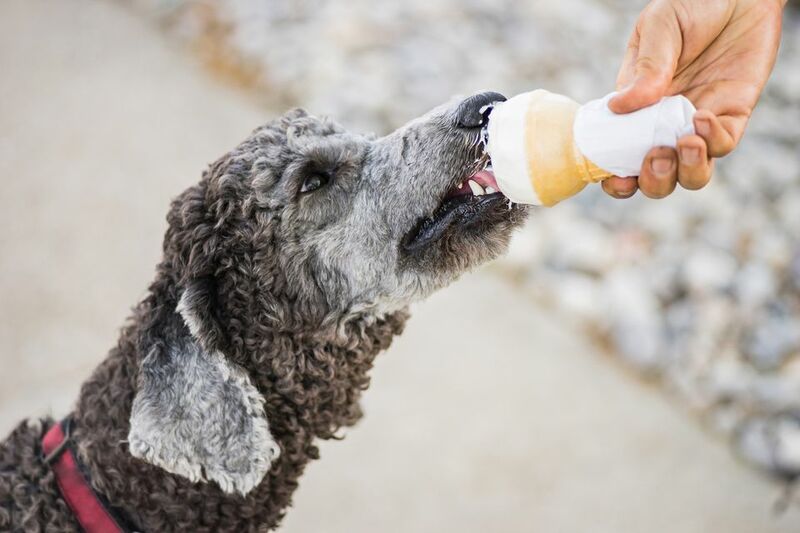 If you’d like to give your dog a cooling treat to sample during the summer, consider making homemade ice cream for your pup. Pureeing bananas, peanut butter, and a bit of yogurt (which has less lactose than ice cream) will create a delicious treat that you can freeze at home. You can also add in some oats, apples, or other healthy, dog-friendly ingredients. Vegan “nice cream” and frozen yogurt are both potentially better for your dog as well, as they often have less sugar and are lower in (or free of) dairy. As with any rich new treat, start out by feeding your pup just a little bit. Wait a few hours to see how she responds to the food before giving her more. If your dog ate ice cream without your “permission,” try to stay calm. Figure out what flavor the ice cream was and how much your dog ate. If your dog didn’t eat any dangerous ingredients, they are probably going to be OK. They might be gassy or need to go potty a few extra times, though, so you might want to spend the afternoon in the yard with them! But if your dog ate ice cream with artificial sweeteners, macadamia nuts, coffee, chocolate, grapes, or raisins, you might have a serious situation on hand. Animal poison control can help you determine what to do next. That said, don’t delay going to the vet. If possible, have someone else drive while you call poison control, or vice versa. The bottom line is that, as a general rule, ice cream isn’t a good treat for dogs. Peanut butter, banana, and yogurt mash can be a delicious frozen treat instead. There are simply too many potentially risky ingredients in ice cream for dogs.